The Bodrato 130-gram Chubby Dark Chocolate Pig is a delicious treat from one of the top Italian chocolatiers: producers of high quality chocolate for 74 years, combining artisan skill with a love of experimentation. The secret of the goodness of the Bodrato Chubby Dark Chocolate Pig lies in the excellent raw materials. Bodrato chocolate has an intense, lingering taste, and is free from preservatives and hydrogenated fats. 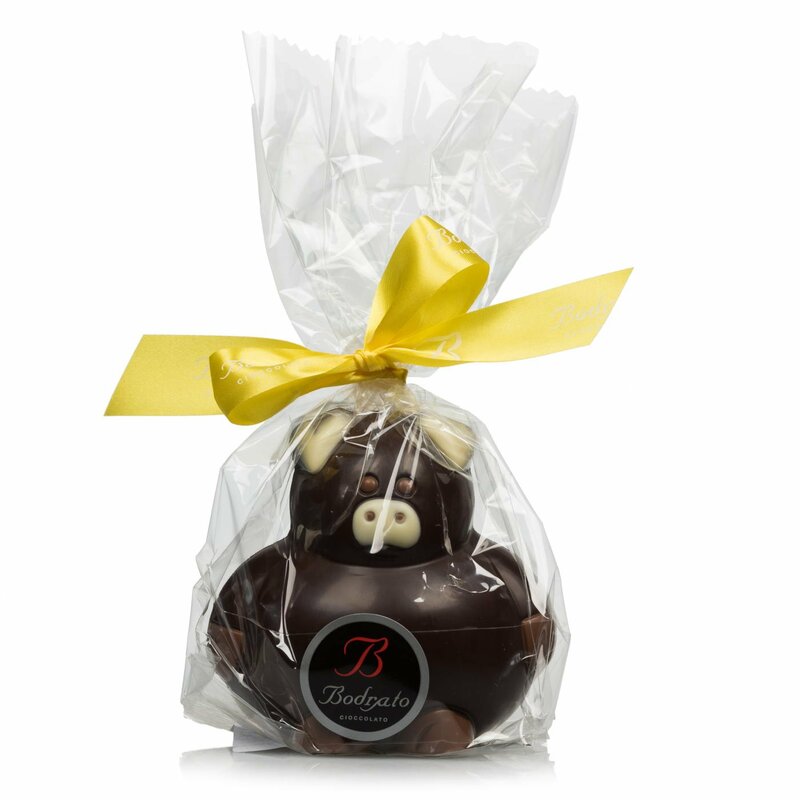 The Bodrato Chubby Chocolate Pig makes a delightful Easter gift for lovers of dark chocolate. Ingredients Dark chocolate (min. 60% cocoa solids), cocoa paste, sugar, cocoa butter, emulsifier: soy lecithin, natural vanilla flavouring. Decoration: Milk chocolate (min. 32% cocoa solids), sugar, cocoa butter, whole milk powder, cocoa paste, emulsifier: soy lecithin, natural vanilla flavouring. White chocolate (min. 29.5% cocoa solids), sugar, cocoa butter, whole milk powder, emulsifier: soy lecithin, natural vanilla flavouring. For more information on product labels, please contact our Customer Service department. The information on the labels of the products may vary for reasons beyond our control, therefore, there may be discrepancies between the information on the site and that on the products delivered. Please always check the information on the product before consumption or use.